G.P. Putnam's Sons Books for Young Readers, 9780399173301, 320pp. When eleven-year-old Thyme Owens’ little brother, Val, is accepted into a new cancer drug trial, it’s just the second chance that he needs. But it also means the Owens family has to move to New York, thousands of miles away from Thyme’s best friend and everything she knows and loves. 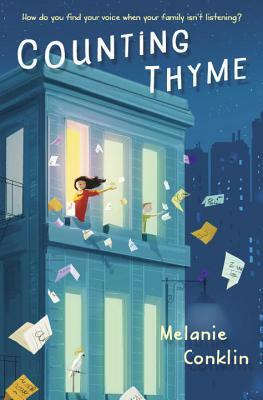 The island of Manhattan doesn’t exactly inspire new beginnings, but Thyme tries to embrace the change for what it is: temporary. After Val’s treatment shows real promise and Mr. Owens accepts a full-time position in the city, Thyme has to face the frightening possibility that the move to New York is permanent. Thyme loves her brother, and knows the trial could save his life—she’d give anything for him to be well—but she still wants to go home, although the guilt of not wanting to stay is agonizing. She finds herself even more mixed up when her heart feels the tug of new friends, a first crush, and even a crotchety neighbor and his sweet whistling bird. All Thyme can do is count the minutes, the hours, and days, and hope time can bring both a miracle for Val and a way back home. With equal parts heart and humor, Melanie Conklin’s debut is a courageous and charming story of love and family—and what it means to be counted. Melanie Conklin is a writer, reader, and all-around lover of books and those who create them. She lives in South Orange, New Jersey, with her husband and two small maniacs. Melanie spent a decade as a product designer and approaches her writing with the same three-dimensional thinking and fastidious attention to detail. Counting Thyme is her debut novel.